In November 2016, I went on an expedition to the Himalaya to climb and ski Pumori. Read about my trip on Feathered Friends blog page. Enjoy! I balanced on the rope stretched between the peaks of my dreams, wavered in the wind some but ultimately made it to the other side. Enjoy a look into a day backcountry skiing in Lofoten, Norway. This was Dave’s first visit to Chamonix. As a Cascadian climber, his climbing career has never included trams doing the approach work for you. Where’s the Devil’s club? No where to be found, only espresso waiting at the top. We arrived into the cloud of the Brevent, and walked a grueling 10 minutes down to the base of the 5 pitch sport route. I had to describe the view, as Dave joked that he could be anywhere in the thick cloud. I managed to keep my cool on the damp slab, and as we approached the crux pitch, a couple of groups had bunched up. A French guide ahead of us was taking a while, an unusual event. Trying not to psyche myself out, I ignored the grunting above, and kept chatting with Dave. My turn came, and oh yes, it was wet. Dripping wet in fact. But it was sport, and it was faster to continue so I got on with it. Near the top of the pitch was a soaking wet off-width 6a (5.10a) crack. “Well, here we go” I thought to myself. Somehow, the moves felt smooth. Probably because I forced my attention to every detail, and I made it cleanly to the top. The French guide admitted that he had pulled on gear because “Oh la! C’était difficile comme ça!” I smiled in agreement, and enjoyed my inner victory of climbing it clean in that state. We topped out, still in the cloud, and enjoyed our two minute walk to the tram. This was going to be a good week. This was our second of what we are hoping is an annual climbing trip to destinations around the world. Here is the second installment of our "INTO" series. Enjoy! As promised, here is a more detailed account of our recent trip to Alaska. Sidetracked is a UK based magazine helping to support adventurers around the world. Enjoy! “Looking for a female ski mountaineering guide,” the NW mountain guides information exchange message read, and it was written by my good friend Sheldon no less. I emailed her immediately saying I was interested, even before I heard what the job was. Flying in, the beauty of the mountains rising out of the sea quieted my fears about the lack of snow. The water is tropical blue, with the smell of seaweed next to the snowy road. Looking up, there are endless possibilities scattered on every mountainside. The first week here was testing with heavy rains up to the top of the peaks, but adventure prevailed and we were still able to find good skiing everyday. The temperatures finally dropped and a clean slate fell all the way down to the sea. The skies cleared and Lofoten shared its magic. Want to come visit?! Contact Northern Alpine Guides. It’s been an interesting first three months here in Chamonix, France. There was a great visit by the entire Smart family over the holidays, where my middle brother got engaged! December in Chamonix provided lonely Aiguille du Midi bins, and some of the most crowded streets I have ever walked on. Once the holidays finished, I exhaled and smiled as I was able to walk a straight line down main street. However, it didn’t last for long, and as the days passed, the mountains became the holiday street. I find myself longing for the quiet Cascades, and the solitude that one is able to find there. Douglas, Devin, and Irene Smart at the top of the Aiguille du Midi. (From left to right) Erin, Miles, and Liz Smart skiing the pre-equipped arête off the Aiguille du Midi in December. I wasn’t sure how I would handle not being able to work as a mountain guide in France yet. I tried finding odd jobs to start: babysitting, driving, assistant guiding, and even helped an event with 20 Scottish Delegates. It’s been good, but not great. And while the training for my next guide courses and exams has been good, I am ready to ski guide again. This March, I will be heading up to Lofoten, Norway and will be guiding for Northern Alpine Guides. I am so excited to see this new place, get my skins wet, and be back in some quieter mountains. Don’t get me wrong, Chamonix hasn’t been all bad! The beginning of this journey of "moving" to France has been rocky, but it has solidified what matters most to me about my life, and the mountains. The jury is still out on where I will call home for the next five years, but it's a quality problem. An overdue video, with no late fees. After my trip to the Bugaboos this summer, I was very excited to see the footage I took with my new camera (yes, I finally upgraded from the iPhone footage). Unfortunately, once I got home, I discovered that my old computer could not handle the HD footage. Bummer. With many things on the list to do before I left the States, getting a new computer was near the top. So here I am, in Chamonix, with my new computer, excited to see that the two systems work! This means a lot of good footage to come this next year! 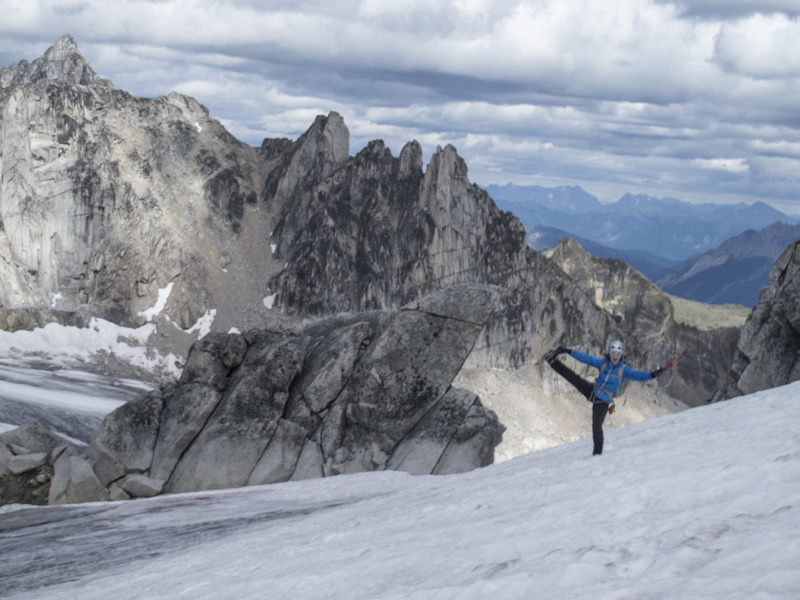 Until then, please enjoy this video from the Bugaboos. Salut! I was lucky enough to have started skiing shortly after I learned to walk, so skiing feels more comfortable than walking most of the time. Climbing on the other hand, is a different story. I began climbing at a young age, but sporadically, and mostly in gyms. I did not really get into climbing until college. Starting later, I had a greater sense of my limits, and my mind always seemed to get in the way. 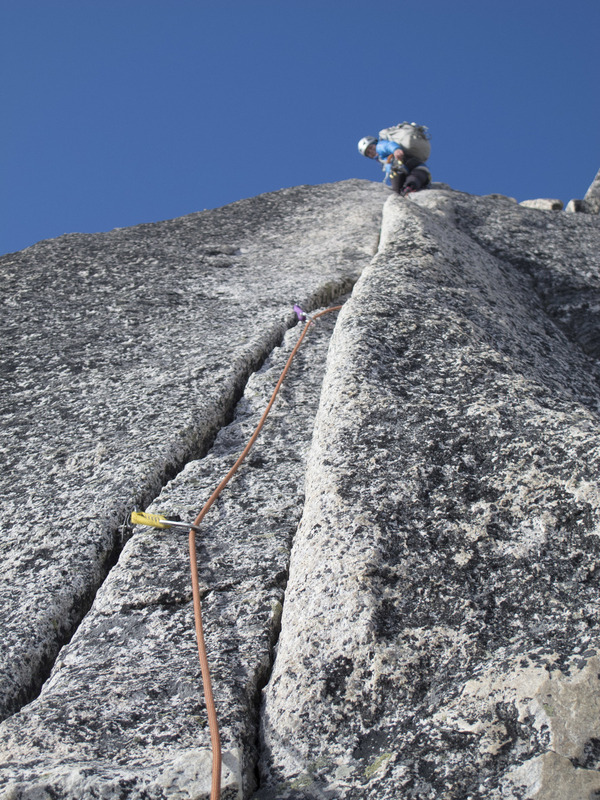 I was a strong follower for years, following mostly my brother Miles up such climbs as the East Buttress of El Capitan, and loving every minute of it. However, when it came time for me to be on the sharp end, I would hesitate, and always let my more experienced partners take the lead. Erin and Yoshiko on Birdland in Red Rocks, spring 2010. I finally started leading more four years ago, starting with a trip to Red Rocks with my friend Yoshiko, who I had just met on our AMGA Ski Guide Course in spring of 2010. I knew I needed to catch up on my technical skills, and Yoshiko was training for her Rock Guide Course. I tagged along, and learned so much from her that first Red Rock road trip, and by the following fall, I finished my second road trip (first official Rocktober), leading as much moderate as I could get on. Forest on the East Buttress of El Capitan, fall 2012. Working my way through the grades, and quieting my mind, I have been able to make progress in my climbing these last few years. Last fall I started out another road trip visiting Miles in Yosemite. We went up the East Buttress again, but this time I was able to take the .8 and .9 leads (I definitely gave the .10b away). Seeing how far I had come since I scraped myself up that climb the first time was rewarding to say the least. But the greatest gift that climb gave me was a confidence boost in my leading that I greatly needed. I finished last season with successfully completing my AMGA Rock Instructor Course, and some motivating leads under my belt. 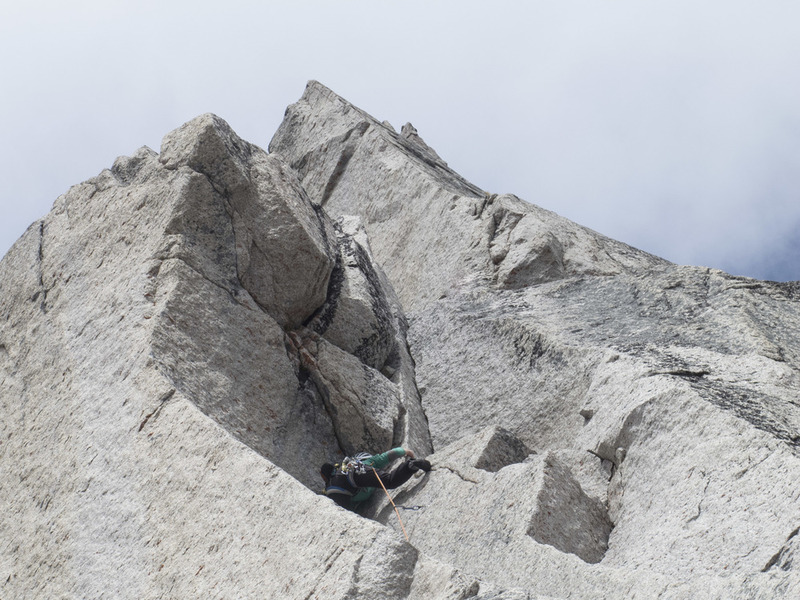 This past summer, I had a lot more great leads (for me), some in the Bugaboos, and some in the Cascades, including the Gendarme pitches on Mount Stuart, which I was especially excited about. 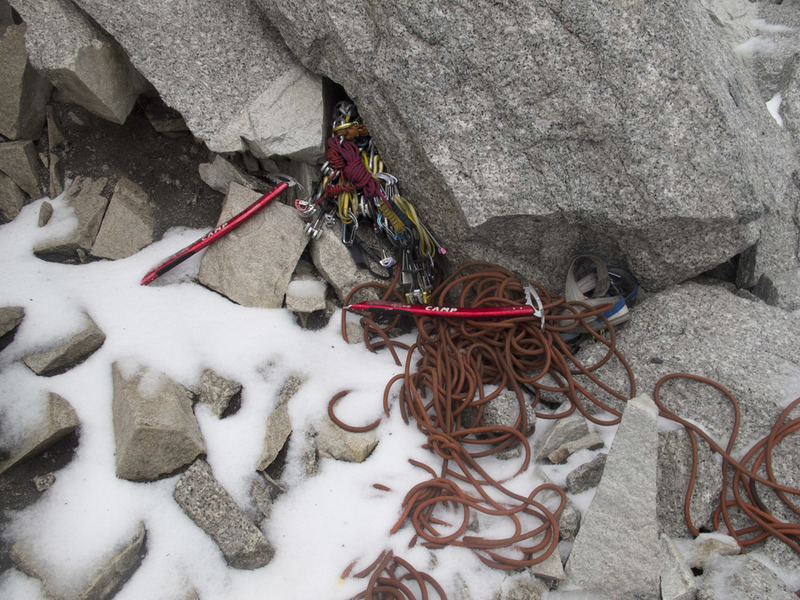 However, starting this fall’s climbing season, I felt in a rut. I had been making great progress these last few years, and I felt like I hit a wall this season. It might have been my mind, or my body, or more likely a combination, but I was stuck. I wanted to get on a handful of .10’s this season, and it just didn’t happen. I did climb a lot though, which is never a bad thing. I was able to get on a lot of new climbs, and explore zones in the canyons that I had never been before. Nearing the end of the season, there was one climb that I wanted to get on, “The Fox,” a 5.10d in Red Rocks. I top roped this climb my first time to Red Rocks with Yoshiko, and I remembered its quality even then, when I am pretty sure I could barely get up the thing. Two weeks ago, I went to the climb with a group of friends. I knew I was just going to top rope it, but I wanted to get a base line of my climbing. My first go on the climb, I hung during the crux, and then figured out the best way for me to climb through it. I rested a bit, tried it again, and I climbed it clean. Walking away from the climb that day, I thought to myself, “I think I could lead that.” Instead of going for it straight away, I told myself that I would try and lead it the last day of the season. This was definitely going to be a jump in grades for me. Up to this point the hardest trad climb that I had led cleanly was a .10a. “The Fox” is an easier .10d, takes good gear, and has a clean fall, and I felt ready to push myself. I did not think this was going to be easy. The potential for hanging and falling was high, but I just felt like it was something I needed to do. The final day of the season came. I hiked up the base with my husband Forest, and our friend Trevor who had been climbing with me the previous week. Looking up at this beautiful line, I felt ready to see what I could do. My mind fell quiet, and my body felt strong. The climb started smoothly, and once to the splitter crack, I was ready to send. I made my way up, probably placing too much gear, but better too much than too little for my first .10d! I was just below the crux, and heart racing, placed a solid #4, and took a breather. I rehearsed the moves in my head, and once my heart was back to a normal rate, I told Forest it was back on me, and made the moves. It was over so fast, and it felt so smooth. But the climb was not over yet, and now I was really feeling my arms, and my heart racing. I made it to a hands free rest in the small chimney. I was so close to the top, only a couple more moves to make and I was at the anchor. I am not sure if it was because I thought I was through the hardest part already, or what, but I did not rest long enough. I went for the chimney-stem move, and while a little stuck in the crack, I reached for a good hold, but suddenly and unexpectedly I peeled off the wall. Erin leading "The Fox" 5.10d in Red Rocks, fall 2013. I knew immediately that I had messed up my ankle. I am not sure if it was the twisting in the crack, or in the landing, but one thing was for sure, no second try for me this year. Forest lowered me down to the ground, and I managed to crab walk out to the main trail, where Forest and Trevor lent me their shoulders for crutches back to the car. Pushing yourself is not supposed to be easy. If it’s easy and comfortable, then you are well within your limits. To get better, we sometimes have to get out of that comfort zone, and yes, flirt with the idea of injury or failure. I got unlucky on Saturday. It was a good climb to push myself on, with good protection, and a clean fall, but my ankle was just in the wrong spot at the wrong time. Driving home to the NW after finding out what The Fox had to say. I don’t regret climbing it. 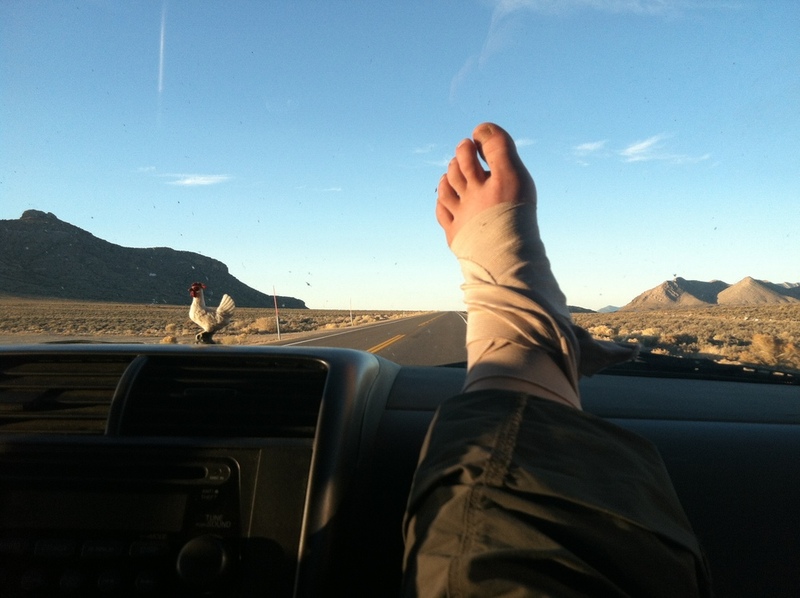 My sprained ankle will heal in time for ski season, and my mind is now opened to a new grade. I was almost there, and I now know I will get there next season. Not knowing what is to come. Ten years ago, when I was seventeen, I was preparing to leave for a winter season in La Grave, France. This was going to be my first time living without my parents, my first time living in a foreign country, and my first time not knowing what was to come. Now, a decade later, my husband and I just received word that our three-year French work visa application was accepted. On December 5, 2013, we will be moving to Chamonix, France. While I still might not know what is to come, I excitedly await this next chapter in my life. Forest and I are on the road in the desert, climbing, working, and adjusting to the idea that we will be moving away from these wide-open spaces. The vastness of America is overwhelming at times, but the solitude and beauty of a sunset in the desert is beyond words. While we are moving to France for a multitude of great reasons, it is hard to ignore the bittersweet reality that we are leaving home. I will be returning to the States often for work, and for the continuation of my AMGA courses and exams, so it is easier leaving knowing that this is not a permanent shift away from the rugged snowy peaks of the Cascades, or the warm rock of the desert. Because I am not yet an IFMGA guide, I cannot work as a guide in France, so instead I will be working on some personal climbing and skiing goals. Check back this winter to see some projects that I will be working on! Salut! Erin in La Grave when she was 17. April 4, 2004. Sunset in Joshua Tree National Park. 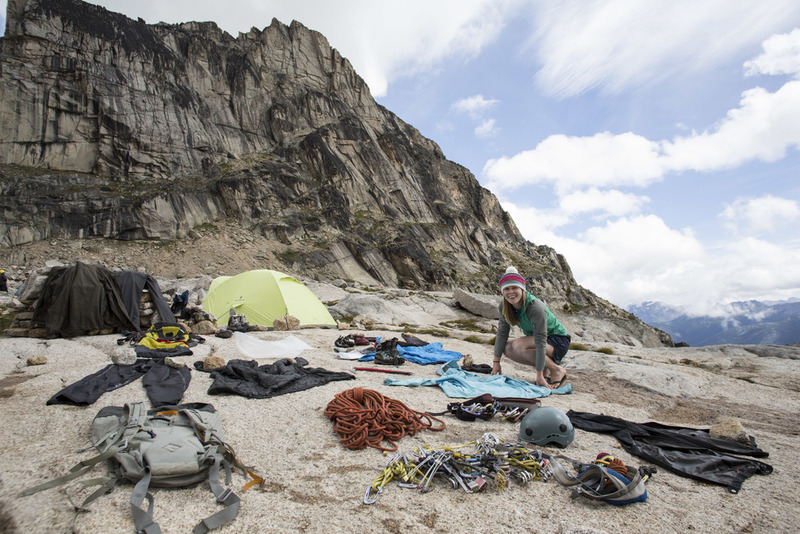 Erin Smart and Kurt Hicks on the Isolation Traverse. March 2013. Aiguille du Midi. February 2011. What a cool name, right?! And the mountains didn't disappoint either. 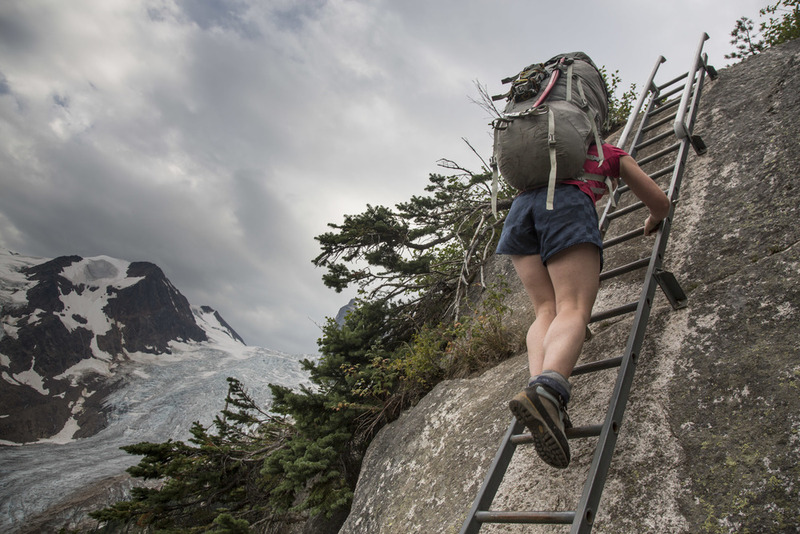 The Bugaboos are hidden away in eastern BC, within the Purcell Range. My friend Dave Moskowitz and I planned this trip last winter. This was the first time in a long time that I had pre-planned a mountain trip so far in advance. Seeing it on the calendar for all those months allowed for the anticipation and excitement to grow more so than usual to go and explore a new area. 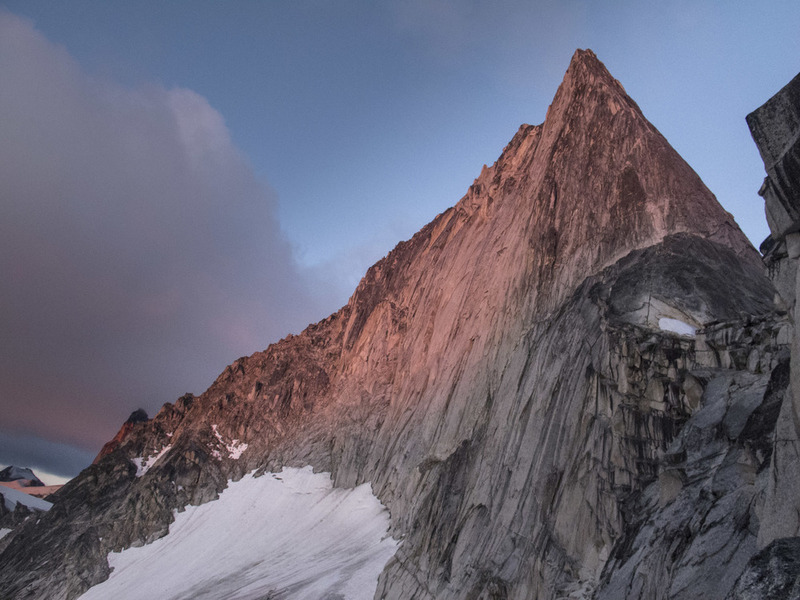 This trip reignited my alpine motivation, and gave me a whole new list of routes I want to climb. 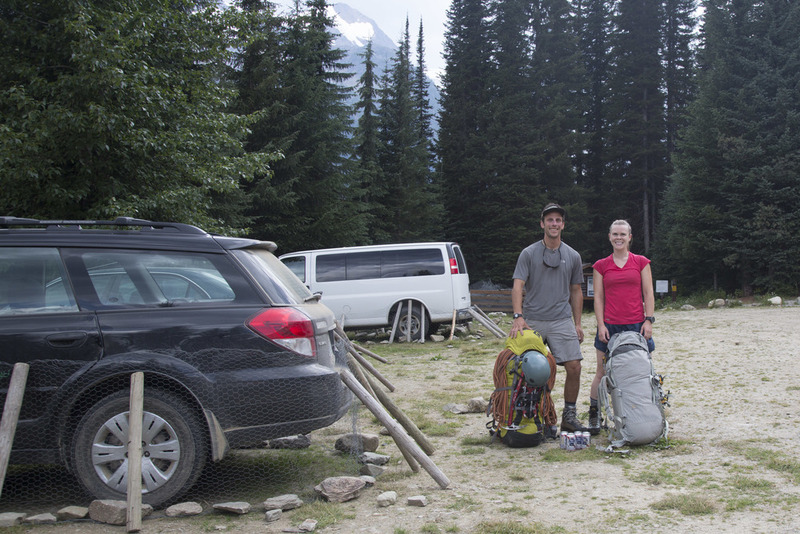 Thanks for the adventure Bugaboos! I'll be back. In April, I took the AMGA Ski Mountaineering Guide Exam. This Exam was the culmination of the last several years of my AMGA ski guide training, and the last 25 years of my life growing up as a skier. After putting my all into this 8-day event, I received the news that I had passed! I am now an AMGA certified ski mountaineering guide. It means so much to me that I received the Chad VanderHam memorial scholarship. Chad was right there at the beginning of my ski mountaineering experiences, sharing a room with me my first season in La Grave. While I had been skiing my whole life, that first season in La Grave when I was 17 changed the way I viewed skiing and the mountains in general. Chad was so welcoming and encouraging to me that first season, despite my naivete, always telling me to get after it, while also helping me to improve my skills along the way. Chad was a great friend, my roommate, a teacher of the finer things in life—sharing his love for fine wines, teaching me to make the best soup ever—forever-coined “Chad soup”, and of course, he was a guide to me. Chad inspired me to push myself, and taught me how to never say, “I can’t” in the mountains, and in life. I think Chad would be proud to see how far I have come since that first winter, and I owe so much of where I am today to his influence. I am so happy to have gone through my first AMGA exam, and I look forward to continuing my education. This month, I am off to the Tetons to take the AMGA Alpine Guide Course, and if all goes smoothly there, I will officially be half way to the full certification! Thank you to the AMGA and the Chad VanderHam Memorial Fund. Here is a video of the exam in Valdez, AK, enjoy! The Isolation Traverse, plus some! I was lucky enough to just complete the best ski traverse I have ever done. The weather was perfect, the snow was unbelievably good, I skied probably the best ski descent of my life so far, and the company included my favorite mountain partner, my husband Forest McBrian, and Kurt Hicks, a dear friend that joined us for this adventure. I took a lot of footage with my iPhone on this trip, and Forest took a lot of great photos, so I will let this video show you a glimpse of our trip. Enjoy! Certain things in life inspire us. For me, I am inspired by the mountains, specifically, skiing them. The peak of my inspiration is couloirs. My eyes are instantly drawn to these beautiful, snaking features that create a passageway in some of the most raw and wild mountainsides. It's as if the word aesthetic was made for them. Forest McBrian looking out at the Four Brothers during the sunrise. Last winter, my then fiancé, now husband Forest and I came upon a couloir on an adventure we had skiing Lemah 1. We were camped at Glacier Lake, and a beautiful line stood above us as we went to sleep that night. Due to work and conditions, it remained un-skied last year, but it was at the top of my list for this season. Forest and I saw a small weather window opening in the forecast on the 30th and the 31st, and it coincided with time off of work for both of us. We threw out some ideas, the usual suspects like Shuksan and Baker, but we both quickly agreed to go to the place we'd been thinking of all along. Both of us having slogged up Gold Creek one too many times, we decided to make the beginning of the tour a bit more interesting by entering via a Kendall couloir and skiing down into Silver Creek. Kendall offered up the goods, and it was surprisingly good skiing down into the trees in Silver Creek. We ended up being able to put in a long, downhill traverse all the way past the drainage to Alaska Lake. From there we stayed on the NW side of the creek, closely following the summer trail, and the travel was relatively easy. Once we passed the drainage of Joe Lake, we began arcing around to the east, and found our camp at 4500’ below the Four Brothers. We dug out our snow cave, and were asleep by 7pm. The next morning we were skinning by 5:45am, in complete darkness. Even though the moon was close to full, there was a thick cloud layer, making the darkness thick. We moved our way up towards the Brothers, slowly at times, stopping and assessing the snowpack. There was a lot more faceting in the snow then we had expected to see, and it was enough to make us pause throughout our ascent. After enough good observations, digging in the snow, and no red flags, we felt good about our terrain selection and continued on. Nearing the top of the ridge, it was beginning to get light, but it was not the impressive sunrise we were hoping for. Being on the west side of the ridge, we thought we had missed all the colors. But to our delight, as soon as we crested the ridge, the sky went on fire. It was one of the more spectacular sunrises I have ever seen. The Three Queens in all their glory. The entrance to the couloir was pleasantly easy to find, and it was extremely inviting. After some discussion about the conditions, and agreeing that we both liked what we saw, we dropped in. This couloir was made for skiing. 1500’ of everything you could hope for in a couloir: steep sidewalls, a clean line, steep turns, and not a soul for miles. It helped too that the snow conditions were about as good as they get. Forest McBrian laying in the first tracks ever in the NW Couloir of the Four Brothers. Once we reached Glacier Lake, we quickly transitioned and made our way back to camp. Our way out of Gold Creek was fast, as our up-track made for an easy glide out, and vise versa: our downward traverse was a perfectly broken trail for our way back up into Silver Creek. As we rose out of the trees into Silver Creek basin we were surprised to find it quite busy. The “Kendall Adventure Zone,” a once secret stash of couloirs, was crawling with at least 10 skiers and split boarders, and the slopes were pretty tracked-out. We passed through the crowd quietly and swiftly, having our new couloir fueling our spirits. It was an incredible way to end the year. While the classic lines in the Cascades are classic for a reason, I am happy to live in a place where there are still incredible lines and routes to be discovered if you are willing to put forth the effort. As backcountry skiing continues to become a more popular sport, there are still places where seeing someone else would be as rare as skiing a first descent in perfect conditions! Enjoy this video I made of our trip! After spending the Fall on the road in the desert, it felt incredible to be back up in the alpine of the Cascades. This day happened to be filled not only with the mountains, but also with great company, cloudless sunshine, and skis (my favorite form of transportation/recreation). Forest McBrian skiing on the Muir snowfield. I like climbing, I truly do. But every Fall, during the annual extended "roctober", I find myself distracted by thoughts of freezing levels, precipitation amounts, and oh yes, powder. I try to stay focused on the task at hand, getting better at rock climbing, especially this last Fall because I was training for my AMGA Rock Instructor Course. But every time I would find myself with cell service or a wifi signal, I would find the NOAA Cascades weather page up on my iPhone. Although it was a long drive home from Joshua Tree (almost 800 miles on I-5), Forest, my new husband and I both felt a sense of ease heading north, heading into the clouds. By mid-Oregon the rain had started, and both of us grew smiles because we knew we were getting close to home. The first week back in North Bend, it was near flooding, and I couldn't have been happier. For those of you who are from the NW, you may know these emotions well, or you may think I am crazy for loving the rain as much as I do. But to me it means the possibility of snow. The possibility of endless powder days, a deep snowpack, and true happiness. I am never as happy as I am when I am skiing. This last Sunday, I went up to the Muir snowfield with a few friends. We knew that we may run into the rain crust from Friday, but the weather looked good, and there was snow on the ground. While the crust was there, along with some nicely formed sastrugi, rain runnels, and frozen marbles on the snow's surface, the majority of the descent was was reminiscent of a creamy, windblown piste. It's hard to complain about snow conditions when the weather is beautiful, there are humbling glaciers surrounding you, and you are laughing with friends. That being said, here's hoping for some rain in North Bend, and some snow in the mountains!